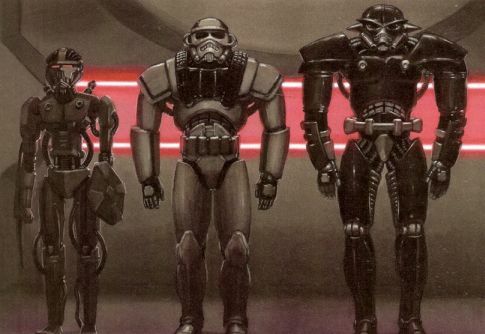 The Dark Trooper Phase I is little more than an automated killing machine. It is a droid specially designed to be the most lethal killing machine the Empire ever produced, and its skeletal appearance is frightening to all who oppose it. -Movement sensor (+2D to search for moving objects up to 100 meters away. -Self Destruct Mechanism: To prevent suit from falling into enemy hands, suit destroys itself in 1D rounds if deactivated by any means. Causes 5D/4D/3D damage. Requires a Very Difficult security roll to disable. Dark Trooper Phase I: 7th level Soldier; Init +7; Defense 21; Spd. 20m; VP/WP: 64/17; Atk +12/+7 melee (2d6+4, Vibroblade), +11/+6 punch (1d3+4, unarmed); SQ Damage Reduction: 5; SV Fort +8, Ref +7, Will ±0; SZ M; Str 18, Dex 16, Con 17, Int 8, Wis 6, Cha 2. Equipment: Vibroblade, armor plating (+4 to Def, no Dex penalty), motion sensor, Self-Destruct Mechanism (If the trooper inside the suit dies, then suit destroys itself after 1d6 rounds. The explosion is as per a thermal detonator [see Core Rulebook, p. 116], and only a Computer Use roll [DC 30] from inside the suit can disable the device). Skills: Demolitions +5, Hide +5, Move Silently +6, Repair +3, Search +2, Spot +2. Feats: Ambidexterity, Armor Proficiency (light), Armor Proficiency (medium), Armor Proficiency (heavy), Cleave, Improved Initiative, Lightning Reflexes, Power Attack, Weapon Focus (Vibroblade), Weapon Group (simple weapons), Weapon Group (blaster pistols), Weapon Group (blaster rifles), Weapon Group (heavy weapons), Weapon Group (vibro weapons).